What Drugs Might Cause Side Effects in My Character With Alice in Wonderland Syndrome? Q: I have a question about Alice in Wonderland Syndrome (AIWS) My character is in his mid-30s. From what I’ve gathered from reading about this syndrome, it is fairly common with children and with migraine sufferers and it is controllable. However, I want my character to have side-effects. In other words, even though the AIWS and his migraines are under control, he is increasingly erratic. Insomnia, impotence, and irritability would all be a bonus. Could he be dosing himself with some type of herb that he doesn’t realize would have these side-effects when combined with the medication prescribed for AIWS. Or is there a medication for AIWS that might cause these kind of side-effects but be subtle enough in the beginning that the person becomes mentally unstable before he realizes something is wrong? A: Alice in Wonderland Syndrome is also known as Todd’s Syndrome. It is a neurologic condition that leads to disorientation and visual and size perception disturbances (micropsia and macropsia). This means that their perception of size and distance is distorted. Much like Alice after she descended into the rabbit hole and consumed the food and drink she was offered. AIWS is associated with migraines, tumors, and some psychoactive drugs. It is treated in a similar fashion to standard migraines with various combinations of anticonvulsants, antidepressants, beta blockers, and calcium channel blockers. Both anticonvulsants (Dilantin, the benzodiazepines such as Valium and Xanax, and others) and antidepressants (the SSRIs like Lexpro and Prozac, the MAOIs like Marplan and Nardil,, and the tricyclic antidepressants like Elavil and Tofranil, and others) have significant psychological side effects. Side effects such as insomnia, irritability, impotence, confusion, disorientation, delusions, hallucinations, and bizarre behaviors of all types–some aggressive and others depressive. Beta blockers can cause fatigue, sleepiness, and impotence. The calcium channel blockers in general have fewer side effects at least on a psychiatric level. As for herbs almost anything that would cause psychiatric affects could have detrimental outcomes in your character. Cannabis, mushrooms, LSD, ecstasy, and other hallucinogens could easily make his symptoms worse and his behavior unpredictable. Your sufferer could easily be placed on one of the anticonvulsants, one of the antidepressants, or a combination of two of these drugs and develop almost any of the above side effects, in any degree, and in any combination that you want. This should give you a great deal to work with. What is Alice in Wonderland (AIWS) Syndrome? A neuropsychiatric syndrome—also know as Todd’s Syndrome after Dr. John Todd, the physician who first described it in 1955—in which perceptions are distorted and visual hallucinations can occur. Often objects take an odd size and spatial characteristics—-just as Alice experienced. They can appear unusually small (micropsia), large (macropsia, close (pelopsia, or far (teleopsia). It can be caused by many things including hallucinogenic drugs, seizures, migraines, strokes, brain injuries, fevers, infections, psychiatric medications, and tumors. Migraines are often preceded by auras—visual, auditory, olfactory. Lewis Carroll was known to suffer from migraines. His own diary revealed he had visited William Bowman, an ophthalmologist, about the visual manifestations he regularly had when his migraines flared. So it just might be that he himself experienced AIWS and took his experiences to create Alice. Q&A: What Injuries Can Occur With a Car Bomb? Q: How far away would you have to be from a car bomb (the kind that is detonated by starting the car) to survive with injuries and what sorts of injuries might you sustain in the blast? A: This is a question that is virtually impossible to answer with any degree of accuracy. There are entirely too many variables involved. How big is the bomb? How big is the car? How close is close? What direction does the shrapnel fly and in which direction is the concussive force of the bomb directed? Are there any intervening walls or structures that might dampen the concussive force or block or redirect the shrapnel? Each of these variables, and many others, must be taken into account before any prediction of possible injuries can be entertained. Lets look at a few general principles however. Big bombs cause big problems and little bombs cause less. A large bomb can produce a massive concussive force that will spread out for many yards in every direction. It can also produce shrapnel that can fly many hundreds of feet. A small bomb, needless to say, would release a smaller concussive force and any shrapnel would move at a slower rate and therefore do less damage. Let’s assume that this is a moderate sized bomb and the victim is standing close enough to receive injuries from the explosion. There are several types of injuries that can occur with a bomb. If the person is close enough and the bomb is of the type that produces a great deal of heat, then burns over the skin and face can occur and even the victim’s clothing might catch fire. This could produce severe injury to the flesh and the lungs. The concussive force of the bomb is simply a wave of air molecules that are accelerated to very high speed. When the wave strikes an object or a person, damage and bodily trauma will result. This is why a bomb will destroy a building, knock down a wall, or kill a person within the concussive umbrella. If the force is strong enough it can burst eardrums, cause sinuses within the nose and face to bleed, rupture the lungs, rupture the abdomen and internal organs, and many other nasty injuries. If the person is slightly further away, or if the concussive force is dampened somewhat, then injuries to the eardrums and sinuses may occur but the other more severe injuries to the lungs and internal organs might not occur. Shrapnel presents a very difficult and dangerous situation. With a car exploding all types of shrapnel can be fired in every direction. Chunks of metal and glass, complete doors or windows, beams of metal and even the engine can be launched in any direction. The types of injuries that someone would suffer depends upon exactly what strikes them, where they are struck, and with what speed and force they are hit. I think it would be obvious that if a car door or engine or some large piece of metal struck someone at very high velocity it would most likely kill them instantly and if not their injuries would be so severe that without very aggressive medical treatment and luck they would die from these in short order. But what about smaller pieces of glass and metal? These can penetrate the head, the chest, or the abdomen and damage vital organs and lead to death very quickly. Or they can enter the same areas and lead to massive injury and bleeding, which can then lead to death in minutes to an hour or so. Or they could simply be flesh wounds and the person could survive but would likely require surgical repair of the wounds and treatment with antibiotics to prevent secondary infections. You can see almost anything can happen in this explosive situation. A large explosion at a great distance could easily do the same damage as a smaller one where the person was standing close by. Any bomb where the concussive force and shrapnel were directed away from the person might produce no injuries while if the victim were standing in the path of the concussive wave and the shrapnel he could be killed instantly. And anywhere in between. This great degree of variation in what actually happens is good for storytelling since it means that you can craft your story almost any way you want. Q and A: Can My Villain Cook Attempt a Murder Using Contaminated Food? Q: My villain is a cook and he wants to kill the hero by feeding him tainted food. I want to avoid using a detectable poison, so I thought a deliberately introduced food-borne pathogen, such as ptomaine, botulism, E.coli, or salmonella, or something like those, would do it. But how do I get the bacteria/germs/whatever in the food? What will it do to him? How long would it take him to die, and what steps could the hero take to make sure he survives? What could the villain do to make sure the hero dies? A: This scenario will work but there are a few problems with it. First of all, using bacteria for murder is extremely unpredictable and most killers prefer a more predictable method. Just because your villain feeds contaminated food to the victim it does not mean that he will die because contaminated food rarely kills people but rather merely makes them sick. Typically people survive these types of illness—but not always. The best way to assure, or at least increase the probability, that your victim would die is to prevent him from reaching medical care. Infectious processes most often kill by two mechanisms. The first is that they alter the function of the infected organ. For example, pneumonia can kill by infecting the lungs and filling the air spaces with bacteria and liquids we call exudates. This is simply the body’s reaction to the infection. Like a weeping wound or one that forms pus. This is what happens in the lungs and if so it interferes with the exchange of oxygen and the victim can die because the lungs fail. An infection in the kidneys can do the same thing by causing kidney failure and infection in the gastrointestinal tract, which is what would most frequently happen with ingested bacteria, can lead to severe diarrhea and dehydration or in some cases or severe bleeding and death can follow from shock. But the most treacherous thing associated with any of these infections is the passage of the bacteria from the infected organ into the bloodstream. We call this sepsis or septicemia, big words that mean infection in the blood stream. When this happens the infection spreads rapidly throughout the body and very quickly the victim can suffer from septic shock–low blood pressure and shock from bacteria in the blood stream. This can lead to death in short order. So regardless of which bacterium you decide to use, it would need to be added to the food and the victim ingest it. This would make him ill with gastrointestinal symptoms such as nausea, vomiting, diarrhea, abdominal pain, and perhaps bleeding in either the diarrhea or the vomiting. If untreated such an infection could then spread to the bloodstream and be deadly. But the key here is that he must be prevented from reaching medical help. Otherwise he would be treated and survive. But untreated his chance of survival is dramatically reduced. So you need to figure a way to prevent him from reaching medical care once he developed symptoms. As for what bacteria to use, both ptomaine and botulism would be very difficult to come by. They are rare and your cook would have no access to this type of organism. He could of course damage a can of some food product and leave it sitting in a warm environment and hope that the right bacteria grew but most likely it would not be the bacterium that causes botulism. That’s actually quite rare. So there would be no way for him to predict what organism would occur under that circumstance. On the other hand, things such as E. coli, Salmonella, and Shigella are quite common causes of food-borne gastrointestinal illness. If your chef knew someone who was infected with one of these, perhaps from a recent trip to Mexico where these are not uncommonly encountered, he could then use this individual to supply the needed bacteria. How would he do this? The best way would be to obtain some stool from the infected individual. This could be from contaminated toilet paper or an un-flushed toilet. Gross but that’s the way it is. This could then be placed into some food product and allowed to grow, which he could simply do a closet at home. He could then add some of this bacterial soup to the food product and in this way introduce a large amount of bacteria to the victim. Even better would be if he could find a way to inject this intravenously into the victim but that’s not absolutely necessary. Again, this would make the victim very ill with gastrointestinal symptoms. Then, as I said, you’ll need to devise some scenario that prevents him from reaching medical help and if so he could easily die from sepsis. There is an excellent non-fiction book in which a murder is committed exactly like this. It involves the murder of Joan Robinson Hill by her husband Dr. John Hill. It took place in the 1960s in Houston Texas and is an incredible story. The book is titled Blood and Money and was written by Tommy Thompson. If you can a copy of this it might help. Dr. Hill apparently grew bacteria in petri dishes at home and infected cream puffs to kill his wife. He then admitted her to a small hospital in the outskirts of Houston and he managed her care, which amounted to preventing her from getting adequate treatment since he did not offer her the treatment she needed. It became a huge and convoluted case that did indeed involved blood and money. Q and A: What Happens If My character Is Shot in the Abdomen With a Crossbow? Q: My question is if a female victim, age 17-18, had a penetrating wound to the far left side of the abdomen just below the ribs, extending 2-3 inches max into the body, what organs if any would be hit and would there be any internal bleeding (if so what major arteries/veins)? 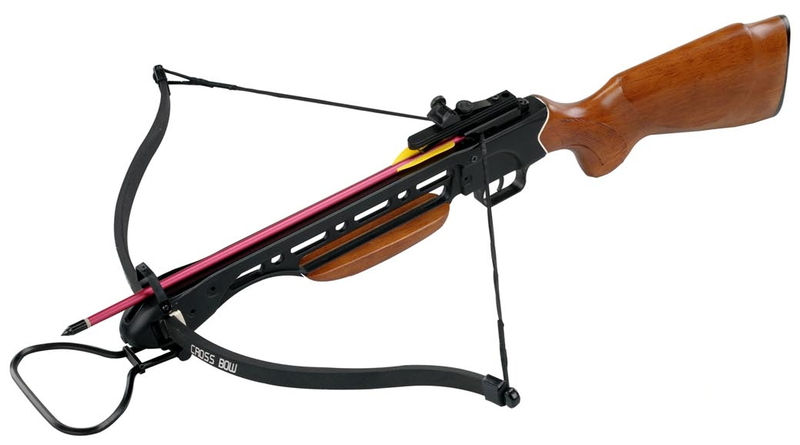 The weapon is a barbed crossbow bolt that prevents manual removal. And for the internal bleeding would cauterization be possible without lasting effects? Also, what would be the estimated recovery time for this injury (victim able to walk without assistance)? A: There are many possibilities and in fact there are hundreds of possible outcomes here. In the left upper quadrant of the abdomen the most likely structures that would be impacted would be the spleen, the pancreas, and the bowel. It is possible that an object that only embedded two or 3 inches into the body would not strike any organs but would rather be more or less a flesh wound. In this case she would be fine and able to do anything with some pain in the area of course. The only real danger here would be an infection in the wound but this would take many days to develop and many more days to become a true medical problem. On the other hand the bolt could penetrate into the abdomen and this would be much more painful and there could be some bleeding within the abdomen which would cause a more or less diffuse pain throughout the abdomen which would be worse with movement, running, coughing, and almost any other activity. This pain would be sharp rather than a dull ache. Once again her life would not be in danger unless a secondary infection followed and she should be able to do most things though again with considerable discomfort. any activity but survived. Here the bleeding could stop as the wound in the spleen clotted and she could recover without any major intervention. Again if no infection followed. very high. Would she be able to do most things? Probably but this would be even more painful than the injuries described above. causing a severe infectious peritonitis. Here the pain would be worse but she could still move around and do things if she were tough. Within a couple of days the infection would be severe and she would have high fevers, chills, severe abdominal pain, and would ultimately slip in the shock and die from what we call septicemia – an infection in the bloodstream. Cautery is simply the burning of the tissues and really has no place here as it causes more damage than help. The reason is that with a bolt such as this weapon there would be very little external bleeding in the cautery he could only be used to control that. It could do nothing for the internal bleeding. To control any external bleeding simply applying pressure with a towel, the piece of clothing, wadded up paper, or anything she had handy would stop the external bleeding. Q and A: Can a Crochet Hook Be Used For Murder? Q: I’m wanting the victim in my next mystery novel to be murdered with a crochet hook. The attacker and victim would be facing each other. The hook would be grabbed off a table and could be either hook end out the thumb side of the hand or out the pinky side of the hand (depending on what you would determine to be the easiest for delivering a fatal blow). It is an impulsive act. The victim is a 5ft. 11in., 157lb. female. Murderer is a 6ft. 1in., 298lb. male. He is a chef. What would be the most likely spots for inflicting a fatal wound? Would the hook need to be removed (the victim bleeds out)? Can the hook be left in and the wound still fatal? Pearl R. Meaker, Lincoln, IL. A: Since this style of hook is made of wood rather than metal, the attack would have to be to a relatively “soft” area. Not likely this could penetrate the chest and reach the heart or get thru the skull without breaking or shattering. 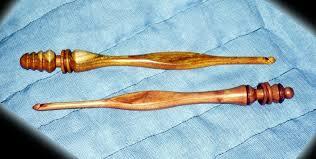 But grabbing the thick end and using the pointed (hooked) end as the weapon could prove deadly. device is removed or left in place after the attack. out after the stab so the blood would have a clear path. In either case, the victim could die in a couple of minutes or, in the eye stabbing scenario, it could take some time—even 30 to 90 minutes or longer. Anything is possible.